There aren’t a whole lot of cars that fulfill the A3’s mission statement, and we imagine Audi wouldn’t have it any other way. In fact, the closest real competitor comes in the form of the car’s direct cousin, the GTI manufactured by parent company Volkswagen. Between them, the A3 and GTI share a 2.0-liter turbocharged engine and both manual and dual-clutch automatic gearbox offerings, and if you don’t care for all-wheel drive it’s difficult to justify shelling out an additional $3,100 for the Audi. Intelligently then, Audi is now offering its Quattro all-wheel drive system with both four- and six-cylinder A3 trims. And while a Quattro car will cost you quite a bit, it brings a lot of versatility to a small, fuel-efficient car that feels well-appointed in base trim but can be optioned out to the point of being downright luxurious. Quattro all-wheel drive is now available with the 2.0-liter engine – until this year extra traction was only available to those who sprung for the 3.2-liter V-6. Audi’s seamless-shifting S tronic dual-clutch transmission has the power to make you forget about traditional automatics all together. Pricing for the Quattro is pretty brutal considering that, on paper, the A3 amounts to little more than a four-door Volkswagen GTI with all-wheel drive and a few Audi trimmings. However, if you don’t want all-wheel drive, the price difference between the Audi and VW is much more reasonable. Quattro isn’t available with a manual transmission, and while adults will fit in the backseat, don’t expect them to do so happily. No one would describe the A3 as blindingly fast, but the low-end torque offered by its turbocharged engine gives it a largely usable powerband with plenty of kick. So much so that it’s hard to imagine the heavier V-6 being necessary in any circumstance. As good as the engine is, it doesn’t have a chance of matching the razor-sharp competence of the S tronic dual-clutch transmission, highlighted by a fantastic sport mode as well as paddles for manual shifting. Variable dampers are used to cushion the ride and give the A3 a taut, controlled feel. The system matches well to the accurate steering, and bumping the suspension into sport mode stiffens the ride noticeably, but not to the point where it’s unpleasant. In fact, half the time we forgot we even had sport mode engaged. Braking is adequate, but the car could really use improved pedal feel. There’s a big neutral chunk at the top of the travel before the brakes grab, and they’re anything but confidence inspiring until you really stand on them. Hopefully, this was isolated to our evaluation vehicle. 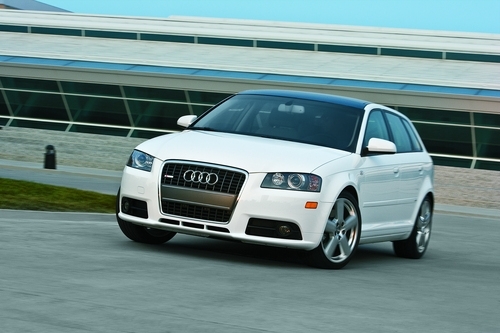 The A3 utilizes a 2.0-liter turbocharged inline four-cylinder engine that makes 200 horsepower and 207 lb-ft of torque. Also on offer is a 3.2-liter V-6 that puts out 250 horsepower and 236 lb-ft of torque. The 2.0-liter engine is available in front-wheel drive form with either a six-speed manual or S tronic dual-clutch automatic transmission, while Quattro cars use either the four- or six-cylinder engine to drive all four wheels via the S tronic setup. Audi’s Magnetic Ride Suspension dynamically adjusts the stiffness of the shocks through use of a clever magnetic fluid, which changes its density – and thus the level of damping – when an electrical charge is sent through it. Normally, we’re fans of Audi’s Multi-Media Interface (MMI) system that’s included with the A3’s navigation package, but in this application the control dial has been mounted vertically on the dash rather than horizontally above the handbrake. The result is a system that’s ergonomically clumsy and unnatural. Not what we’d call typical Audi. With terms like dual-clutch transmission and electronically controlled all-wheel drive being thrown around, one would expect the A3 to bring with it a host of ancillary driver’s aides as well. Electronic stability control (ESP) with electronic brake force distribution (EBD) comes standard, and works in conjunction with an electronic differential lock (EDL) to ensure maximum grip in a variety of surface conditions. ESP can be partially or fully defeated, but most of the time it will stay in the background and let you have your fun. There are a lot of different drivetrain options for the A3, but overall the 2.0-liter engine is a frugal sipper. The manual 2.0T with front-wheel drive returns the highest city/highway fuel economy at 21/30, followed closely by the front-wheel drive S tronic dual-clutch 2.0T at 22/28. Heavier all-wheel drive cars are slightly less efficient, with the S tronic 2.0T Quattro returning 21/28 and the V-6 equipped S tronic 3.2 Quattro coming in at 18/25. Inside, the A3 is a cut above most cars in this price range, with attractively functional build style and quality that’s apparent in all materials used. Audi’s Open Sky sunroof replaces the fixed roof with two large glass panels over the front and rear seats to open up the interior and provide a brighter, more airy environment. LED daytime running lights similar to those featured on the Q5 give the A3 a more modern face and confirm Audi’s newfound obsession with LED technology. New wheels are on offer for 2009 and there have been a few ever-so-subtle changes to the exterior of the A3, though the overall look remains one of simplistic versatility. Pricing for the A3 begins at a base MSRP of $26,920 for a front-wheel drive, manual transmission spec car but grows to $30,500 for a 2.0-liter Quattro. Options don’t come cheap either, and fully-loaded even a 2.0T car can crack the $40k mark with relative ease. Key competitors the $20,200 Mini Cooper Clubman and $23,700 Clubman S, $23,800 Volvo C30, $28,550 Volvo S40, $23,830 Volkswagen GTI 4-door and $29,400 BMW 128. Audi’s decision to join Quattro with the 2.0-liter engine for 2009 should prove wise, as the V-6 not only doesn’t make the car significantly quicker but also costs a hefty sum. Whereas the A3 used to come across as a more expensive version of the front-drive Volkswagen GTI, it now takes its place in the market as a much more sensible entry-level luxury utility hatch. 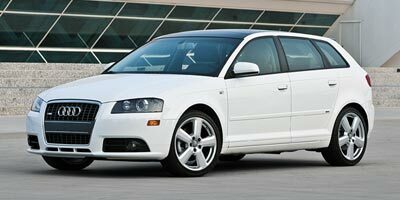 In a sense, this is the A3 we should have had all along.